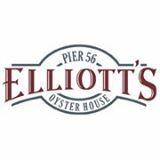 For more than 30 years, Elliott's Oyster House has been Seattle's showcase for classic Northwest seafood. This classic seafood house is renown for simple preparations that highlight the natural flavors of the finest seafood in the Pacific Northwest. We specialize in serving fresh local Dungeness crab, wild Northwest salmon, Alaskan halibut, fresh Pacific finfish, Northwest shellfish, and our specialty, fresh oysters. At Elliott's, we believe our choices today affect the oceans of tomorrow. So we're committed to serving sustainable seafood, a win-win for your taste buds and the environment. We have long-standing partnerships with local crabbers, oyster growers and fishermen, who use environmentally sound practices. To help the planet even further, we compost everything possible. Come join us for lunch or dinner, and discover the wonders of sustainable seafood for yourself.